I thought these would take a great picture, but in reality they look much better sans sugar. So just know you would eat them coated in sugar. What are they? 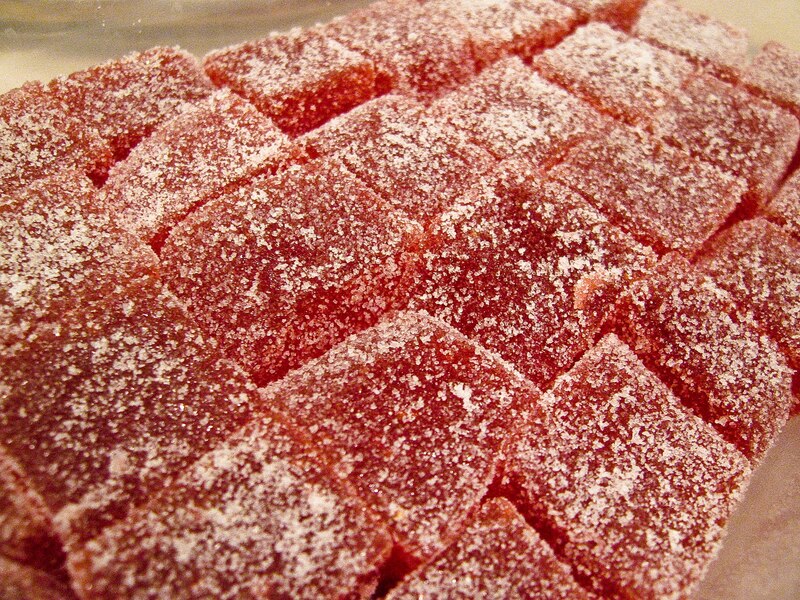 They are what I prefer to call pâte de fruit, because pectin fruit jelly just sounds so blah. But in Europe they are pâte de fruit, and they are sold in the States at high end European bakeries for lots of money. Which is only relevant in that it inspired me to learn to make my own because I could not support the habit I was developing at Pistacia Vera in Columbus. And like many confections, once you make them you discover they are absurdly easy and you begin impressing all of your friends and family with them. These pictures are of plain strawberry and a second batch of lemon strawberry–so if some seem rosier than others, that’s why: 2 different flavors. I plan to try flavor combos involving rhubarb, blueberry, peach and lemon or lime (or more strawberry!) next. According to Peter Greweling, the fabulous author of Chocolates and Confections at Home with The Culinary Institute of America , if it is fruit or a fruit combo and I can envision it into a puree I can try it. So far, the combo flavors are the biggest hit because they better allow me to regulate the sweetness of the final candy. If you like fruity candy like gum drops–or even if you don’t, because these, in my opinion, have a far superior “mouth-feel”– you must try to make these. They keep indefinitely in a sealed container, although I have noticed one of my batches got a little wet the 2nd day and I am wondering if it is because it rained. Try to choose a dry day for making them. You can sub 1 pound of any fruit puree you like, or use 10 oz (1 1/4 cups) juice plus 8 oz (3/4 cup) unsweetened applesauce. Note that you will use 1 tablespoon of lemon juice at the end of the recipe no matter what fruit combo you choose as the acid is necessary. Spray a 9X9 baking pan with oil and then line it with plastic wrap. Lightly oil it again. Bunch the plastic at the tops of the pan so that the plastic wrap will not stretch and rip from the weight of the jellies (wish I had taken a picture of this--sorry!). Smooth the bottom so that there are as few air pockets as possible. Set aside. Set up a food processor or blender and place it on a scale. Grate the zest of one lemon into it. Squeeze the juice of 1½ large and juicy lemons into it (use more lemons if your lemons are dry or small--this is basically to taste, i.e., how much lemon do you want in your strawberry?). Then add strawberries to reach one pound (16 oz); I recommend using frozen if you are off season. Puree until smooth. Open the pectin packets and place them next to the stove (I use a deep but narrow bowl to prevent them from spilling). Combine the puree and 3 cups of sugar in a 4 qt heavy saucepan (Greweling says you can use 2 qt but mine boiled over). Attach a thermometer and stir over medium high heat. Keep stirring until the fruit sugar mix reaches 238 F. Be sure to stir constantly to prevent the fruit from scorching on the bottom of the pan; it is best to use a silicone spatula to continually scrape at the bottom of the pan. When the puree reaches 238 F, add the pectin and return to a boil, still stirring. Stir at a boil for 1 minute. After the minute is up, turn off the heat and add the juice from the remaining half lemon (at least 1 tablespoon). Pour and scrape the puree into the prepared pan. 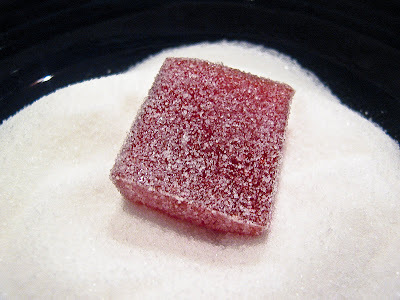 Sprinkle a thin layer of sugar onto the jelly while it is still hot. Set aside to cool completely. When the jelly is cool, invert it onto a wooden cutting board and then remove the plastic wrap. 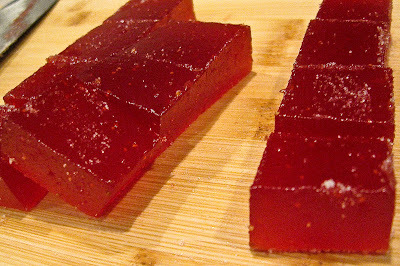 Use an oiled chef's knife to slice the jelly into squares (or whatever shape you want) and then roll the individual pieces in more sugar. Store in a sealed container. Affiliate links were used in this post to link to items I would be discussing and linking to anyway. These look wonderful! I used to love a candy like this when I was a kid, and my husband did too. I'm going to make these and surprise him. Thanks! I've had these given out at the cookie plate at a few high end restaurants. These sound so delicious. 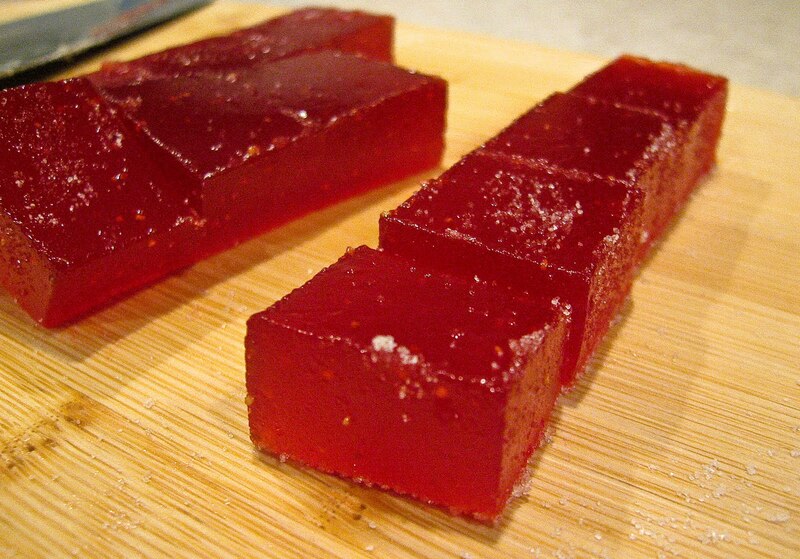 I have been wanting to make a jellied fruit candy type thing. Yours look lovely….I like the name you gave them. Much better than jellied fruit candy type thing that I am contemplating. these are wonderful! the perfect hostess gift for the season coming up. Thanks! 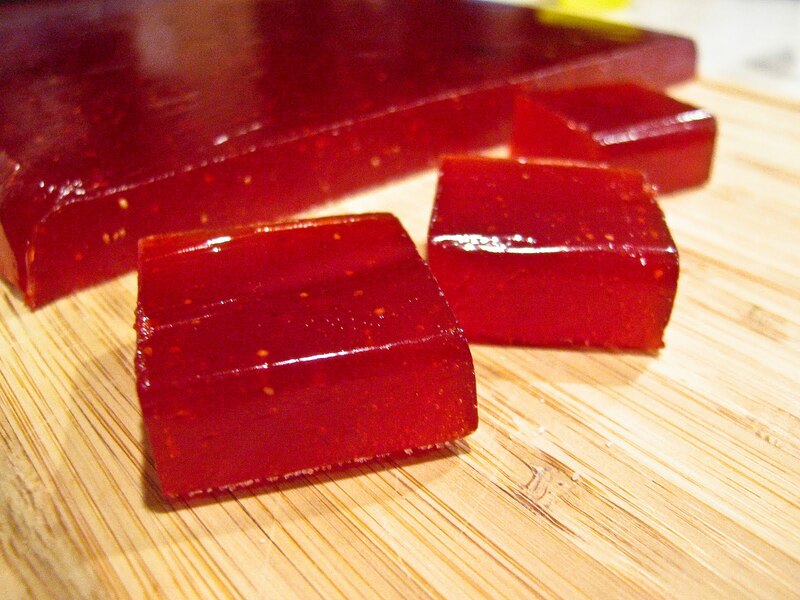 Your jelly candies look really good, I have been dying to make this kind of candy and look forward to giving it a go as Christmas approaches. It would go great in Rocky Road! Anonymous: I mentioned in the post this happened with my second batch also, and the only thing I could guess is that it was because it rained the day I made them. I know that can make a big difference with, for example, marshmallows. You might try storing them without a lid for a few days, allowing them to dry out a bit. Ahhh … thank you for this. You mention wet weather being a problem for one of your batches – I live in Seattle and it was raining LIKE CRAZY when I made my Apple Jellies from heck. I think I may have also used too many apples (I went by number of apples rather than by weight). I may actually try them again and if still no luck, I’ll play around with your recipe and see what happens.These look good and I love the rhubarb idea (strawberry-rhubarb jellies, anyone? um, yes please).